Bloom's new Luxo Sleep collection - it's nursery heaven! Bloom’s new Luxo Sleep collection – it’s nursery heaven! These are the greatest years ever for new parents, in terms of choice in design for nurseries. I find myself being a tad envious of first-time parents with so many gorgeous options open to them! Even five years ago when I was selecting my first baby’s furniture, there was nowhere near the choice that’s available now. Take a look at the divine new collection from Bloom. It’s called Luxo Sleep, and true to Bloom’s form, is totally cutting-edge in looks and functionality. This beautiful cot actually folds up! If there’s a larger age gap between siblings, the Luxo cot can be easily stored and there’s no small parts to lose in the process either – no tools are required for either set up or fold down! 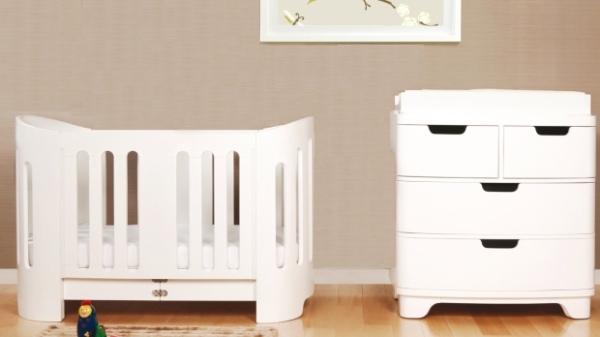 In your choice of Coconut White or two-tone Capuccino, a curvy change table completes the solid wood range. The Luxo cot offers the options of either a fixed or adjustable side rail, and an optional conversion rail enables your child to use it as a bed up to age six. I think I’m just going to have to find a place for my furniture envy as many generations of parents after me will have these increasingly gorgeous options. Luxo Sleep has just arrived at Bebe in Melbourne and retails for $1549.95.